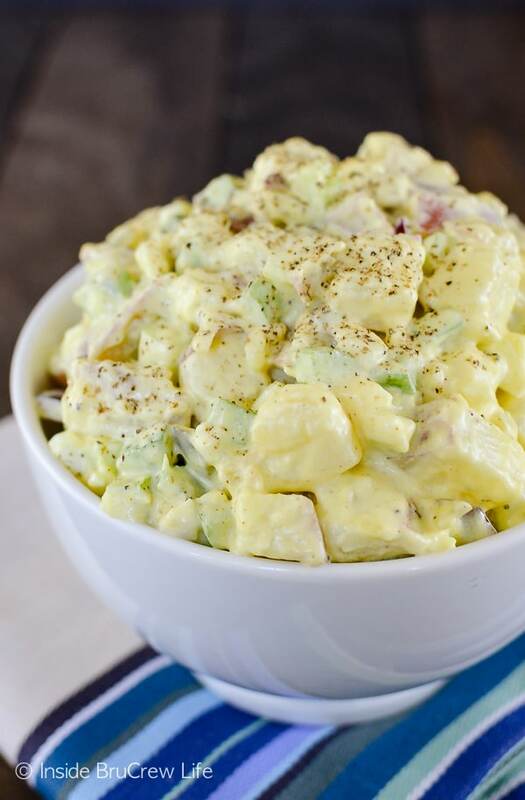 Eggs, pickles, and celery makes Mom’s Potato Salad an easy and delicious side dish. 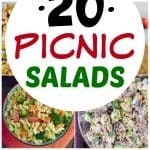 It is the perfect salad to bring to any picnics or barbecues you are headed to this summer. During the summer months we usually live on picnic food, with the occasional taco or pizza night thrown into the rotation. We like to do a lot of grilled chicken, burgers, and this Easy Slow Cooker Pulled Pork for easy dinners. Yes, it is quite the all-American type food. Sometimes we change it up with a big bowl of this Grape Pecan Chicken Salad to be different. 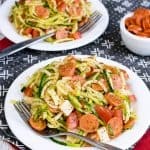 Usually we make a big bowl of this Veggie Pasta Salad or this Cranberry Zucchini Slaw to go along with just about everything. But every so often I get a potato salad craving. Sometimes we jazz it up with bacon, ranch, and cheddar cheese because who doesn’t love a good loaded potato salad. Am I right? But 9 times out of 10 this is the potato salad that we end up making for dinner. Just a simple, classic potato salad, just like the one my mom used to make. I remember eating dinner outside on our picnic table every summer as a kid. My mom made the potato salad, and my dad grilled burgers and dogs. As I got older I took over making dinner, and I continued making the best potato salad recipe the same way my mom did. A big bowl with lots of potatoes, celery, onion, egg, and pickles in a coating of mayonnaise and mustard. Why mess with a good thing, right? Most of the time I just throw a little bit of each ingredient into the bowl until it looks about right. I think this potato salad right here was the first time I have actually measured everything before I stirred it in. I wanted to be able to share the recipe with you, and I thought you would appreciate actual ingredient measurements instead of saying a little bit of this and a little bit of that. Although, you really can’t mess this traditional potato salad up because you make it to taste. If you like more pickles, add more. If you do not like eggs, leave them out. Want to give it a healthy boost? Use half Greek yogurt and half mayonnaise. I do have to say though, this is the best combo of ingredients. It’s a favorite here. Every time I make it for dinner or for a picnic, it disappears in a hurry. It has that mom touch to it that everyone loves! 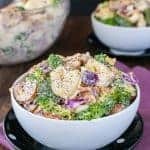 Bacon Broccoli Tortellini Salad – a creamy homemade dressing make this easy pasta and veggie salad a hit with everyone. 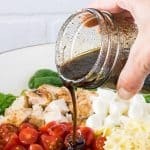 Balsamic Caprese Veggie Salad – this easy four ingredient salad has a great homemade dressing that makes it a healthy dish to bring to picnics. 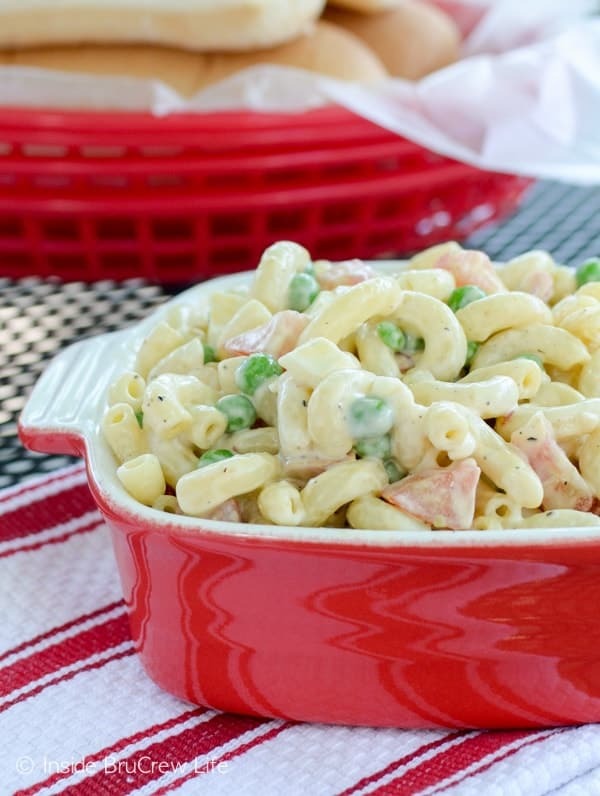 Easy Macaroni Salad – ranch dressing, peas, eggs, and tomatoes in a creamy sauce makes this a great side dish for picnics. 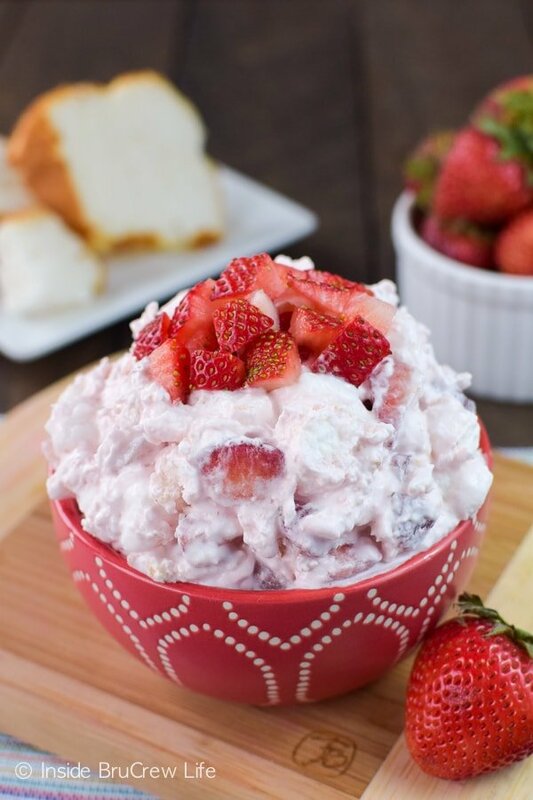 Strawberry Shortcake Fluff Salad – fresh strawberries and angel food cake cubes add a fun twist to this easy dessert salad. 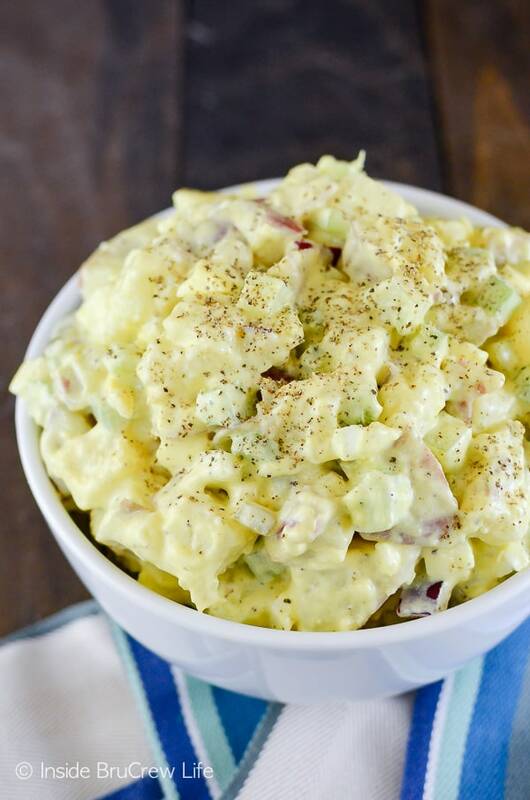 Eggs, pickles, and celery makes Mom's Potato Salad an easy and delicious side dish. 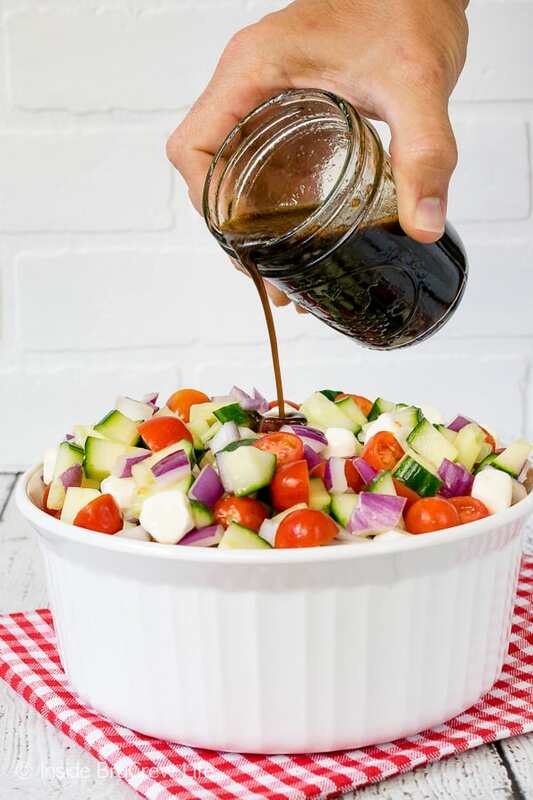 It is the perfect salad to bring to any picnics or barbecues you are headed to this summer. Cover the potatoes with water. Bring to a boil. Reduce heat and continue to simmer until potatoes are tender. A fork or knife should be able to go through the potato without any resistance. Drain and rinse the potatoes. Cover with cold water until the potatoes are cool. Drain again. Stir together the potatoes, celery, pickles, onion, eggs, mayonnaise, and mustard until combined. Season to taste with the salt and pepper. Refrigerate until ready to serve. *This recipe was first posted July 2015. 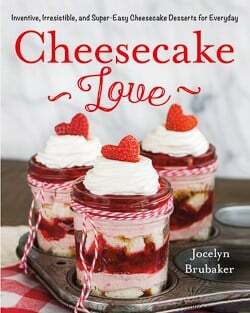 This sounds like a great addition for all of those summer barbecues, Jocelyn! I love the addition of eggs. And that is such a good idea to use half mayo and half greek yogurt. Pinned! Thank you, Gayle. It is the perfect picnic side dish. And yes, every once in a while I sub out some mayo for the yogurt to help cut calories. But it really does taste the best with all mayo. LOL! Potato salad is SUCH a classic, and it’s always good to have the perfect recipe in your back pocket. Which is exactly this! Perfect for my next BBQ! Pinned! Yes, a classic potato salad is the best kind of recipe. Thank you for the pin love! I love potato salads!!! I love that you have pickles in here too, yummy!! I meant a little sugar and sweet pickles and very little mustard. 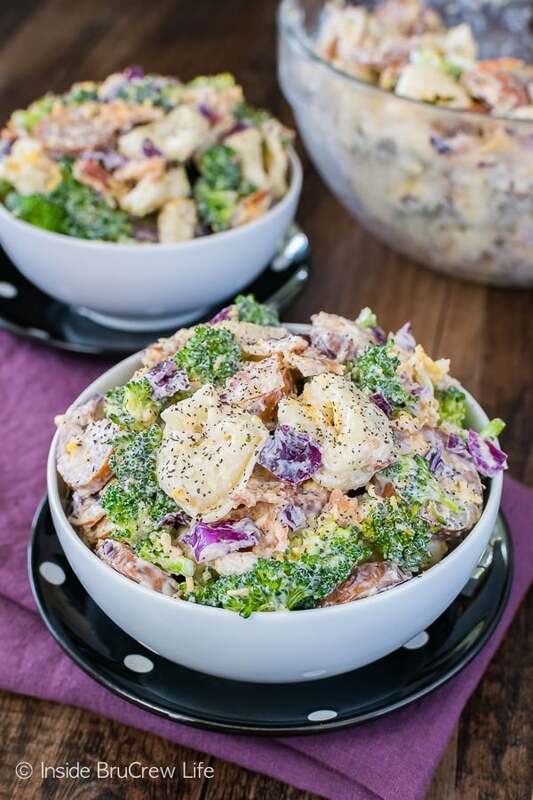 The pickles and eggs are kind of my favorite part of this easy potato salad!!! I totally agree about the getting a taste for potato salad! I love picnic food also. This potato salad does remind me of the ones my mom used to make. Thanks for sharing! Old time recipes from our parents and grandparents are really the best recipes!!! 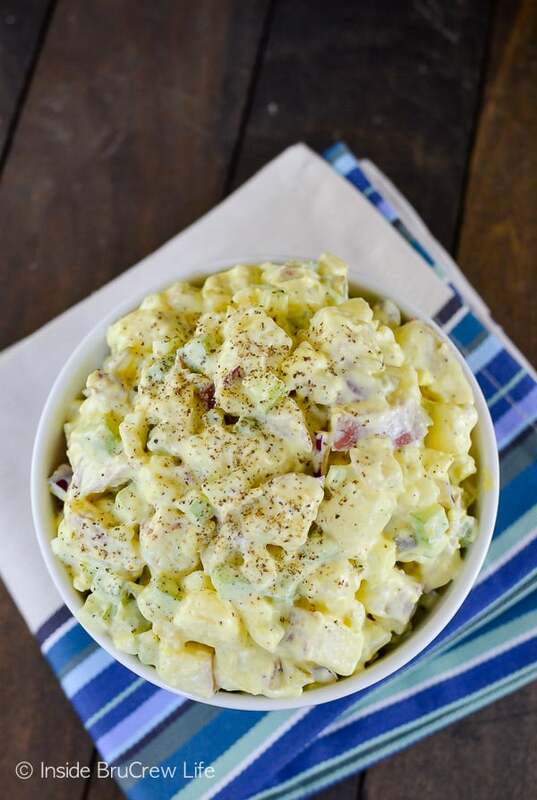 Potato salad is perfect for all those summer picnics. 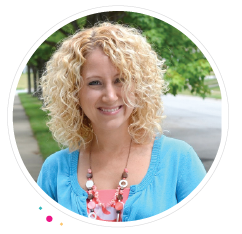 Love that you are sharing your mom’s recipe, the pickles, eggs and celery sound fantastic in here! You can’t go wrong with classic potato salad! I totally agree with you there!!! People have always raved about this potato salad. I think it’s the simplicity and just plain down-home goodness that gives it the yum factor. I love this post! Thank you! You’re the best! You are welcome!!! This one always gets rave reviews when I make it too!!! Love that you used half greek yogurt and mayo! Great idea. And I love my potato salads having eggs in them!! Yum! 🙂 Pinned! I actually almost always use all mayo because I think it tastes better that way, but I thought people would like the option to cut calories. I always add eggs too…it makes it so good! Looks super creamy, Jocelyn! Thank you for sharing with us. Jocelyn, this potato salad looks so good!!! this is what I look forward to in the summer time. . grilling, potato salad and fruit!! Can’t wait to see you again later this month! Thanks Alice. I look forward to picnic food in the summer too! It’s the best kind of food! 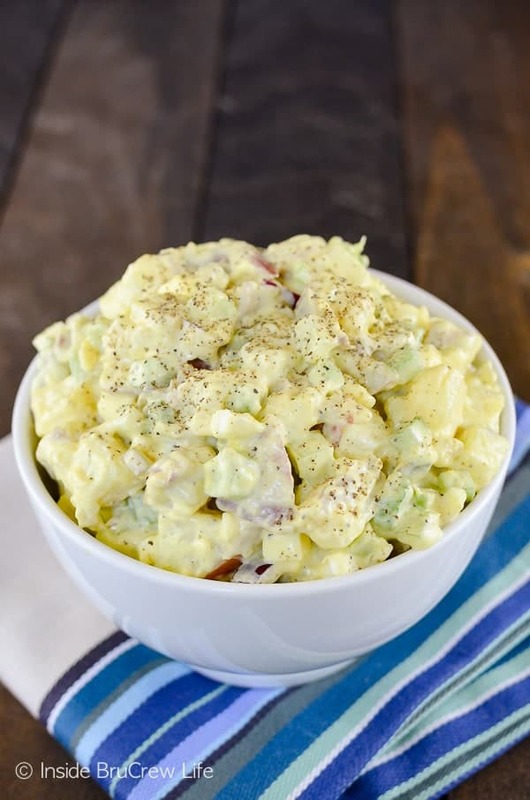 This looks so good, and I make it almost like you do 🙂 everyone loves my potato salad too 🙂 I do add a little pickle juice and a splash or two of hot sauce to mine…..yum…..sometimes I might shred some carrot in it for color……but it’s alway eaten…..taste better the next day…..
Oh, I love the idea of using some pickle juice or hot sauce. I will have to try that next time! 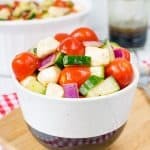 I would like to print the potato salad recipe, can you help me? There is a print button on the recipe card. Click that and it should open a new page that connects with your computer’s printer. I hope that helps. This is EXACTLY how I make my tater salad, right down to dill instead of sweet pickles. Depending on my mood, I also add some celery seed and occasionally some sliced black olives. This basic recipe is a classic in our household. I came across your recipe on pinterest, I then clicked on the link and instantly, I was craving your potato salad. I picked up the ingredients and not only was it super easy to make but it was amazing! Thank you for sharing your recipe! I am so glad to hear that you enjoyed my mom’s potato salad! It’s a family favorite for sure! I’ve been looking for a really classic potato salad recipe and this is so similar to what my grandmother made for us when we were little. 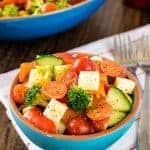 My family is vegan and we make this recipe with vegan mayo and no eggs. Just wanted to say that it’s really delicious and easy to adapt for a vegan diet. Brings back so many good memories. Will be eating this all summer! You make it just like my mom did! Tried this recipe. I’m in my 60’s and have never made a potato salad in my life. My husband (now deceased) didn’t like potato salad so I never had a reason to fix it. I tried this recipe because it sounded closest to my mother’s recipe (who is also deceased) so I couldn’t get hers. Hers is the only one that I liked. It was great. Tasted like my mother’s. My kids and grandkids loved it also. Thank you. I am so glad to hear that you tried the potato salad and that it reminded you of your mother’s recipe! You made my day!! It doesn’t say to peel them because I never peel red potatoes. If you look at the photos again, you will see the peels on some of them. And my guess is a 5 pound bag. I just kept cutting potatoes until I had 10 cups of cubes. Jocelyn: Your comment was exactly what I was thinking!!! I might add why does people ask crazy questions like that one and out of the 5# bag of potatoes you may have one left over, HA, HA, I just get a big laugh that tickles my funny bone. I think some people need to take a cooking course…. I may sound rude but some just don’t use common sense…. Thank You for the recipe, reasonably typed and to understand, and to read. Wow. Rude! Not everyone can cook and they have to start somewhere. Props to them for giving it a shot. I make mine similar to yours, except I use half dill relish & half sweet relish, and I cook my potatoes with the peeling on and when cool, peel and cube them, they seem to have a better taste, that cutting them and cooking them in water….. try it once…. 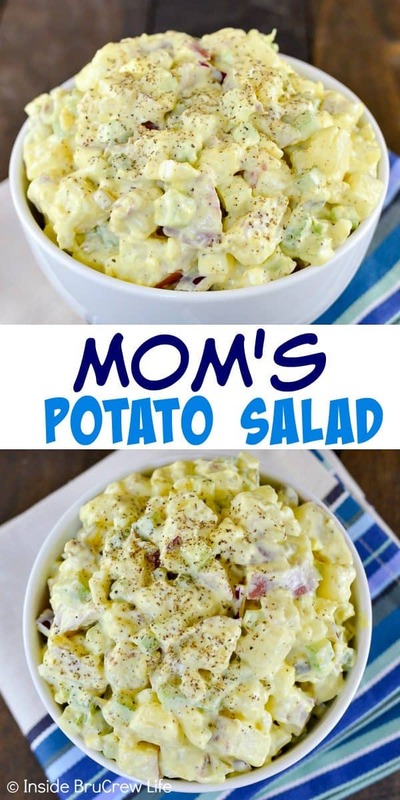 :) I have been wanting homemade potato salad, think I will make some…. Hi – thanks for the potato salad recipe. I have never made potato salad before and I finally tried it. Mine seemed dry. I added about another cup of mayo. Any tips. I made sure I had just 10 cups of potatoes. Is there something else you add? Thanks. I’m glad to hear you tried the recipe. I made the recipe based on how my mom made it when I was growing up. Obviously, everyone has different tastes, so if you thought it was dry and wanted more mayo, that is perfectly fine. I don’t think I could ever make potato salad according to a recipe! My mom didn’t, so when she told me her secret, just a little of this and little of that I didn’t either. And it always came out tasting the same. Low and behold here is our family recipe for potato salad. Couldn’t believe it when I read the ingredients! ( I have added chopped radishes for color if I have them.) All a matter of taste. If it an’t broke, why fix it!!! Thanks so much for the memory. I use red potatoes or yukon gold…I always bake them in a little olive oil, salt and pepper. Just mix them with mayo, sour cream and all the other ingredients…delicious!!!!! This is pretty much the same recipe I use except I had more flavor by cooking the potatoes the day before and while they are still warm toss them with a mixture of 3 tablespoons vegetable oil and 3 tablespoons vinegar (your choice of kind). Cover and chill in the fridge overnight and about 2 hours or more before serving the next day add the remaining ingredients. This warm potatoes absorb the flavors so much better than cold ones. BTW I prefer sweet pickle relish for the dill.